The hearth for heating metal, the forge, must be both safe and effective for use by both amateur and professional blacksmiths and farriers. Combining safety with effectiveness means that a forge must be built to size and weight standards that ease the metalworking process while optimizing airflow, temperature control, and fuel use. Selecting a forge based on fuel type depends chiefly on what and where you plan to work. Because they operate on fire built from a solid fuel source rather than a gas, coal and coke forges have the potential to burn hotter than gas forges. You can minimize fuel use when reducing temperature during idling, and the use of hand cranked blowers allows coal and coke forges to operate anywhere. However, up-front safety training and fire management are essential to the operation of a coal & coke forge. Open fire and the risk of stray burning fuel call for expert handling even at beginner stages. They also require a chimney (when working inside), wind shield (when working outside), or a hood. Post-work maintenance also requires that the forge be cleaned thoroughly after each use. A steady stream of natural gas or propane fuels a gas forge, which burns clean and doesn't leave ash, stains, or buildup. Training for gas forge use is minimal, and since the gas is either contained in the cylinder or burned, there is little prep time and almost no cleanup. Unfortunately, they don't have the same heat potential as coal and coke forges, and they tend to contain heat and gas in a smaller work area than solid-burning forges. Some projects may need the space available to a coal and coke forge to be completed. No certain type of forge is universally better than another, but one type may be more useful for certain professionals than another. Coal & coke forges are better-suited to smiths who are doing serious metal working with sizable pieces that take extended time to work. They also enable forge-welding and can help you save on fuel if you tend to idle. 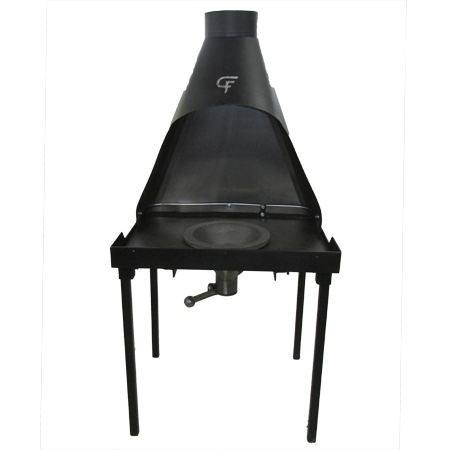 Gas forges are better-suited for farriers who go from barn to barn shoeing horses. They are easier to prepare, use, and maintain. Smiths of all skill levels must first consider the metals with which they will be working and the size of the projects on which they intend to work when selecting tools. Blacksmiths have the fortune of working with either a coal & coke forge or a gas forge. The flexibility of forge types comes from the variety of work that blacksmiths undertake. Most coal & coke forges give blacksmiths the room to heat big sections of metal so that they can undertake large-scale projects using varying techniques and tools. With training and experience, they also offer more variable control over temperature and have more potential to reach higher temperatures than gas forges. 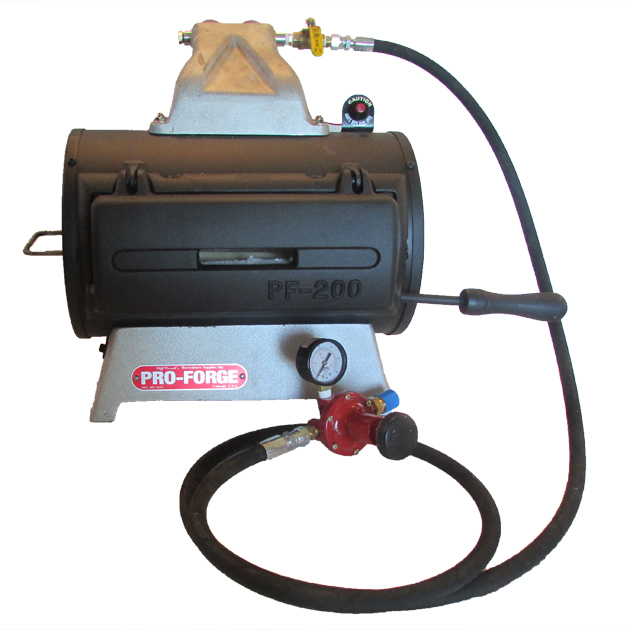 Gas forges, however, offer a more streamlined approach to metalworking. 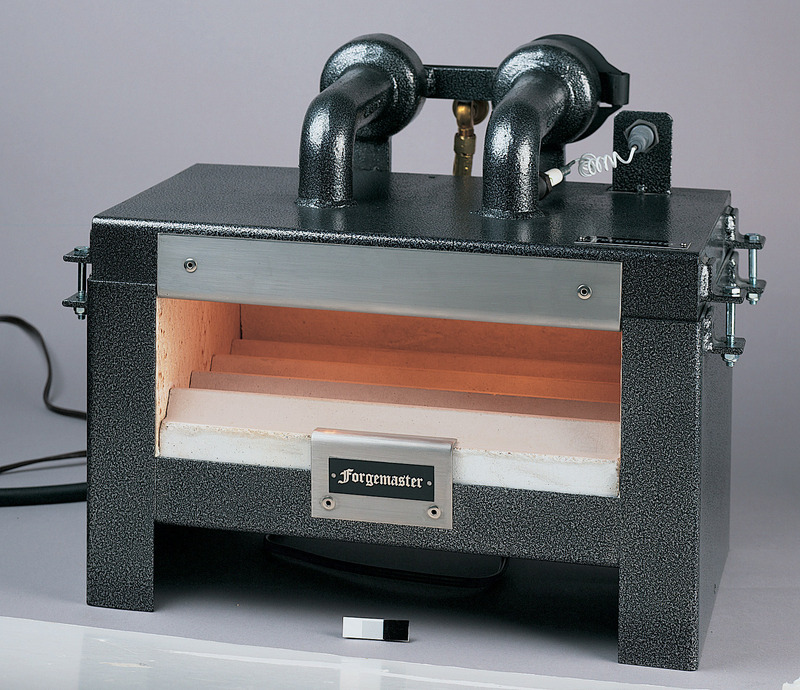 The gas forge idles at full power, maintains a consistent heat, and requires little or no cleanup. Setup is easy, and heat is reliable in a way that keeps work conditions predictable. Farriers work most often with gas forges, because precision is essential to farriers, and the size of farrier pieces tends to be smaller. The gas forge allows farriers to heat consistently so that shaping and working metal is a more predictable experience. The ability to produce and rework horseshoes with consistent results allows farriers to work faster and solve problems with shoeing. Blacksmiths and farriers tend to work in vastly different workspaces. Trade shows and on-site jobs may call for extra mobility, in which case you'll need a forge that can move with you. 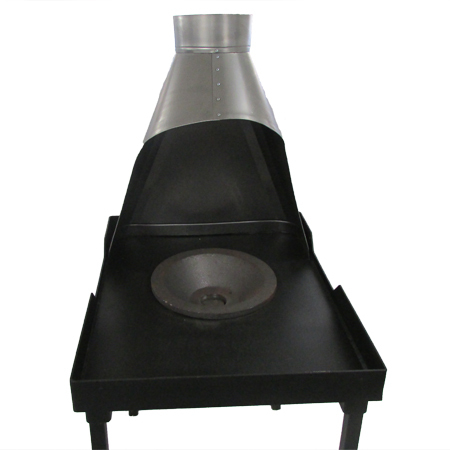 A standard coal & coke or gas forge with either a hood that connects to the chimney or a ventilation port (for gas forges) is all you'll need for an in-shop forge. These can be heavier for improved stability and flexibility when working with denser or heavier metals. The Handy Forge provides mobility being smaller than the shop forges and with handles to enable transportation. Rivet forges are the lightest weight option for farriers and blacksmiths who travel and work. Though the work area is considerably smaller in a rivet forge, it still offers the heat and accessory-ready design necessary to complete metalwork. Each type of forge comes with costs & maintenance particular to its fuel and design. Consider your workspace and how you plan to maintain your forge and its environment when making a selection. A coal & coke forge must be loaded before heating with coal, industrial coke, or charcoal as fuel. To work metal, the fuel must be consistent and the forge should be clean before loading the fuel. The shape & volume of the chosen fuel as well as the amount of air blown through the fuel source will affect the heat level. During work, ash from the fuel must be dumped so that it does not block the air source. Quality forges will include an ash dump in the design of the forge. Your forgeâ€™s design should facilitate thorough cleaning using tools typically found at a blacksmith or farrier shop. The fire produced in a gas forge is clean and the temperature at which it operates is consistent. Because the fuel burned is a gas, it leaves little or no residue. Maintenance on a gas forge only requires occasional cleaning, and smiths must be certain to ventilate during and after working. The best place to buy a blacksmithing or farrier forge is from a retailer who knows the custom needs of blacksmiths and farriers separately. It's also imperative that your retailer be able to identify what features you'll need to include in your forge to adapt it to your workshop or outdoor work area. Centaur Forge has been innovating forges and selecting top-tier blacksmithing and farrier equipment for a long time. Choose from our offering of purpose-built forges to ensure yours fits the specifications of your workshop or outdoor space and can handle the large-scale or precision-scale projects you conquer most often.